In the future growth of the United States economy, Latinos, especially Mexicans, will have a leading role. 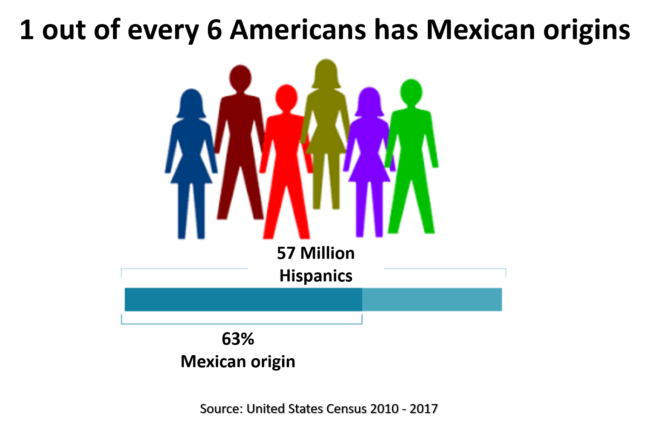 Out of a population of almost 57 million latinos in the US, more than 63% are of Mexican origin, that is, more than 36 million people. This includes Mexican immigrants residing in the United States and Americans who, in the census, identify themselves as of Mexican origin. Although the migration of Mexicans to the US for years was driven by workers without higher education who labored mostly in the agricultural and construction sectors, the outlook has changed in recent years, according to experts. The children of that generation that migrated to the US, one of the first economic powers in the world, are more likely to obtain education at higher levels, and therefore, to earn, spend and invest more money. US-born Latinos are also significantly younger than the average of the general population, which projects them as a key labor and consumer force for the country’s economic growth. Nearly half of US-born Latinos is under 18 years of age, according to data collected by the “Pew Center”. In comparison, only 20% of non-Hispanic white Americans are under the age of 18. This implies that businesses will devote more resources to develop and sell products to Latinos, according to Professor Jeffrey Humphreys, who heads the annual Multicultural Economics report produced by the Selig Center at the University of Georgia. “The purchasing power of Hispanics will increasingly determine the pace of GDP growth in the United States and the region” Professor Jeffrey Humphreys explained. These are some figures that reflect the economic influence that Mexicans have in the United States. Mexicans are the largest group of foreigners in the United States. They are 25% of the 44.5 million immigrants registered in 2017, according to estimates from the Migration Policy Institute, a study center specializing in immigration issues based in Washington. 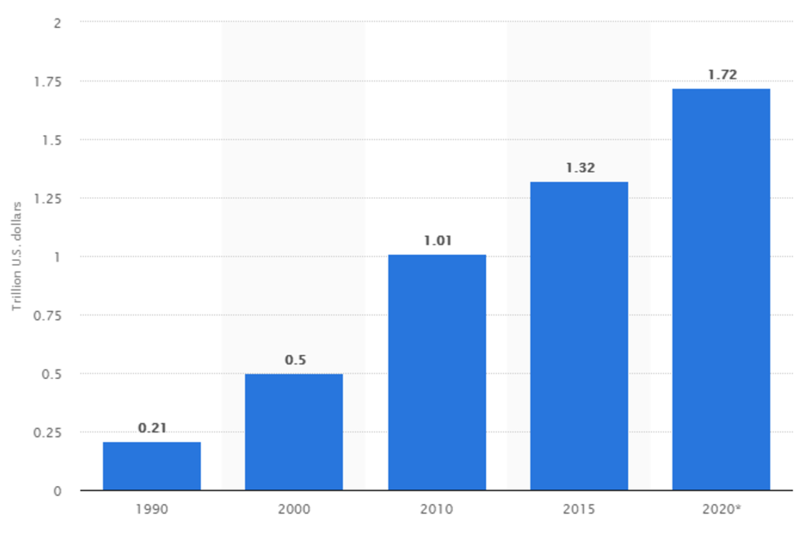 The following statistic illustrates the buying power of Hispanic consumers in the United States from 1990 to 2020. Hispanics spent 1.3-1.5 trillion U.S. dollars in 2015 to 2018. The buying power is expected to increase to 1.7 trillion U.S. dollars by 2020. Products targeting the Hispanic population are seen as a great opportunity for retailers and CPG companies as Hispanics will represent approximately 30 percent of the total U.S. population by 2060. From the above mentioned, Mexicans and Mexican-Americans have a purchasing power of US $ 881 billion. 57.2% of the total purchasing power of the Latino population in the United States. 3. Almost 25% of construction business entrepreneurs are Mexican or of Mexican origin. As a context, according to the US Department of Labor, jobs related to construction and extraction have a growth projection of 11% from 2016 to 2026, faster than the average of all other occupations in the country. The second industry in which they most undertake is professional services, which generally qualify as businesses that require higher education or specific training. For example, legal services, accounting, architecture and engineering, advertising, scientific research, etc. From 2000 to 2016, the workforce of Mexicans aged 16 and over increased from almost 11 million to more than 16 million people, according to figures from the US Department of Labor. 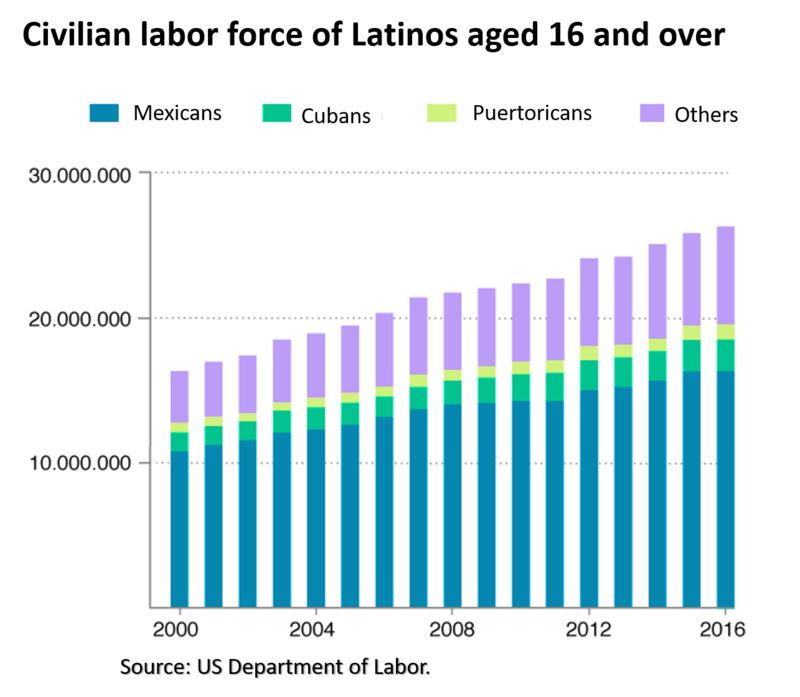 The Mexican is the most numerous, but other influential Latino communities in the country, such as Puerto Rican and Cuban, have also increased their workforce in the same period. In 2017, the government registered 27.4 million foreigners in the country’s workforce, 17% of the national total. Almost half, 48%, was made up of Latinos, while 25% was made up of Asians. The Mexican and Hispanic influence wave will continue growing.